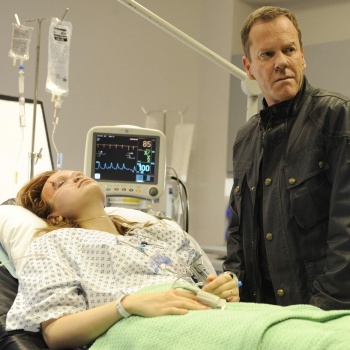 Last week's episode of 24: Live Another Day ended with a bang. To be more specific, Simone, whose mother Margot has quite recently gained control of six American drones, was hit by a bus while chasing her niece, whose mother Simone had just stabbed to death. How's being hit by a bus for dues ex machina? It reminds me of that scene in The Devil Wears Prada in which Emily Blunt's character is hit by a taxi, Hermes scarves flying hither and yon, suddenly making it okay for Anne Hathaway to go to Paris. 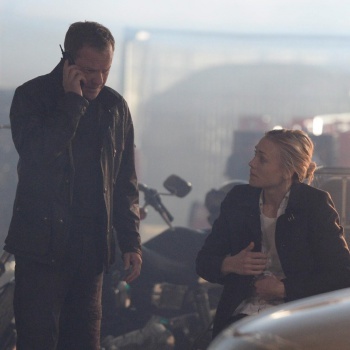 Sadly, conflict in 24 has nothing to do with Paris or fashion (maybe that's another spin-off). Lives are at stake here people! Simone and the girl she was following are taken to the hospital. Now a sitting duck, Simone has found herself the focus of almost every player's action. Her mother, Lady Stark, now sees her as a liability. Simone may tear down everything her mother has tried to build. And that's the theme of this week's episode: what do we do with the entities that might ruin all of our plans? In the real world, one might confront them, maybe even bribe them, but in 24 if your daughter may put your blessed plans in jeopardy, the obvious recourse is to kill her with missiles from a drone. If only life were that easy, huh? Having been betrayed earlier in the day by Simone, Margot decides that nothing would work better to make sure everyone dies than to kill her daughter while killing thousands of others at the same time in a two birds, one stone kind of deal that, when you think about it, makes prefect sense for a terrorist. However, just to ensure that nothing goes wrong, Margot also hires an assassin to go and sort her out. But do we really think Jack Bauer is going to let this crazy lady out in the moors kill her own daughter? Possibly. But, in killing her, Margot would also be killing his only lead, and there's no way Jack is going to let that happen. Still, he needs help, and luckily, President Heller is still on board as a believer in Jack's truth. In asking President Heller for help, Jack informs him that the Brits were sort of the reason his last mission was a bust. The Brits, you say? President Heller is having none of that, so he gives the Prime Minister a stern talking to, to which the Prime Minister responds with a question on President Heller's mental health. Ah, Margot may have her daughter as a loose end, an irritant to her desires, but President Heller has is own mind with which to contend. It would be awful to realize your daughter is betraying you, but wouldn't it be worse to realize your mind is beginning to act against you? What does one do? You can't drone strike your mind, so President Heller sits down with his daughter and son-in-law and tells them to apprise the vice prez of the situation, implying that he's going to step down. If only Margot Al-Harazi had that option. That said, President Heller still has enough of a mind to give Jack everything he needs to breech the hospital and go pump Simone for information about her mother. Will she crack? Is this the end for Margot? Hardly. After donning scrubs and questioning her with no results, Jack tortures Simone - who, P.S., has had a rough day so far -by squeezing her finger stump - you know, the one created when her mother instructed a grunt to chop it off - so hard that she loses consciousness. Well, I guess if one can't get a daughter to roll over on her mother, one can at least inflict paint to the point of passing out. I mean it's all in a day's work for Jack. He answers to no one but the greater good, okay? Kate doesn't see it that way and is pretty grossed out about the whole thing. So, Kate, do we talk about your husband now or later?